Ms. Rahiya M. Shariff is the Senior Human Resource Officer at IHI. She is a dedicated HR professional with over ten-year experience in managing a full spectrum of human resource programs, services, and functions in the not for profit settings. Ms. Shariff is skilled in a range of HR specialties including planning, evaluation of plans and resources, training, compensation, motivation, negotiation and counseling. She also has experience in recruiting, performance management, career development, employee relations, benefits, payroll, safety, compliance issues, community engagement, communication and household surveys. Rahiya has undergone several professional trainings abroad and locally, including Advanced Human Resources Management in Israel; Human Resources Planning and Development in India; employment standards under new labour laws in Tanzania; effective dispute prevention and resolution at work place; and performance management. 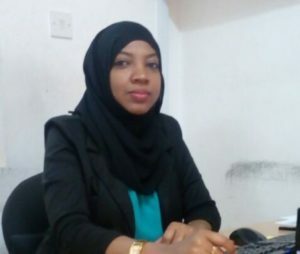 Ms. Shariff holds a Bachelor of Arts Degree in Public Administration from the University of Dar es Salaam and a Masters in Business Administration majoring in Corporate Management from Mzumbe University. She also earned a certificate in Professional Human Resource from the Tanzania Public Service College.